The Rahmnews today is that Rahm's doing a fireside chat in D.C. while two of the top education officials hired by his school board go before a federal grand jury... Those of us who love to read, re-read, and then watch the shiftings of American "history" note that the work of Ken Burns is often in the forefront, for better or worse, in setting an agenda for our historical focus. Take "Baseball." How many events had to be left out to produce that original series, and aren't those of us who went back and got the expanded version (to the "tenth inning") glad to know that there once was a "steroid era"? And so, Hollywood gave us "The Roosevelts" and now those who script Rahm Emanuel have sent him to Washington, D.C. in the middle of the SUPES (and other crookedness) scandals to do a "fireside chat." Rahm tells the public school teachers, parents, and children of Chicago what he thinks of us.Your couldn't make this stuff up. Everyone who's been watching Rahm (and the White House) for years knows that everything possible is scripted. Rahm gets elected after posing (ever so briefly) with as many black people as possible at the 95th St. "L" stop (just long enough for the videos to get in the can) in February 2011. Rahm attacks the teachers via the scripted "Longer School Day" attacks (complete with all those non-Actors Equity extras, the paid protesters who didn't know what their signs meant). Rahm puts on his Mr.Rogers outfit after losing the February 24 vote and facing a runoff. Then Rahm's scriptwriters pull an "Obama" and blame Chuy for "not having a plan" while Rahm gets to ignore the fact that he's been in power as Mayor of Chicago for four years. And so, now it's a "fireside chat" in Washington, D.C. on the night Rahm should be in Chicago answering questions about why his Board of Education hired nothing but out-of-town mercenaries to executive positions in the schools. The day Sherry Ulery and Tracy Martin Thompson have to go before a federal grand jury and Rahm's propagandists at CPS still refuse to send press releases and press conference notices to Substance about things like the Jess Ruiz and David Vitale show on Friday (April 17). 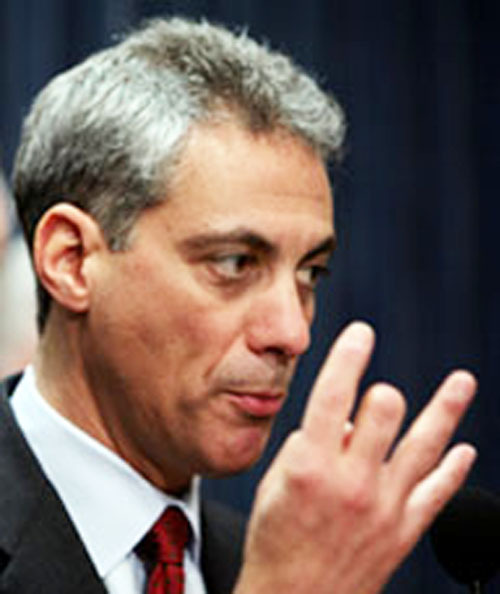 Mayor Emanuel will deliver remarks at the North America�s Building Trades Unions 2015 Legislative Conference. *There will be no media availability following. Mayor Emanuel will participate in a fireside chat to discuss creating a vibrant innovation economy in Chicago.